Why Do Carbohydrates Make You Gain Weight? If you notice a few extra pounds shortly after eating carbohydrates, some of those carbs may have been used to refill your body's stores of glycogen. Carbs can also contribute to weight gain if they cause your levels of blood sugar to cycle up and down. But in the end, carbs can't make you gain weight unless you eat more calories than you use through exercise and activity. After carbohydrates are digested into glucose, sugar goes to the cells that need it for energy. If the blood levels of sugar are too high, sugar goes to the liver where it's converted into a storage form of glucose called glycogen. Glycogen is stored in the liver and skeletal muscles, so they will have an immediate source of energy when your activity level increases. The body can only store a limited amount of glycogen, although endurance training enhances the amount of storage. Depending on your body's capacity and the intensity of activity, glycogen can be depleted in about 20 to 90 minutes. Glycogen molecules hold a significant amount of water. Each gram of glycogen that's stored in your body is attached to 2.7 grams of water, reports the American Council on Exercise. This isn't the same as water retention. When you retain water, the water is held between cells and makes you feel bloated. The water in glycogen is part of its molecular structure. But water still adds weight, so as you load up on carbs and refill your glycogen stores, it can increase your weight by as much as 3 to 5 pounds. Some types of carbohydrates -- white flour, white rice, and foods made with added sugar -- contain small molecules of glucose that are easy to digest, so they enter the bloodstream quickly. When blood sugar spikes, insulin is released to remove the excess sugar. While that's a critical job, it can lead to weight gain. When there's too much sugar in your bloodstream, and insulin can't restore balance by transporting sugar to cells for energy, it sends messages to the liver that it's time to store fat. After the glycogen stores are filled, the liver turns glucose into triglycerides that are stored in adipose tissue. But insulin doesn't stop there. It also tells the fat cells to stop breaking down fat that's already in storage. In other words, insulin prevents you from losing weight while also making you more prone to gaining weight. People who are pre-diabetic or who have had stomach surgery may have reactive hypoglycemia, which means the pancreas sends too much insulin into the bloodstream after eating. As a result, too much glucose is removed and the blood sugar drops below normal levels. Even if your last meal wasn't that long ago, low blood sugar makes you feel hungry, and you're more likely to overeat. The most obvious way you can gain weight from carbohydrates is through overconsumption. While excess calories from any macronutrient -- carbohydrate, protein or fat -- will add pounds, carbs may be a bigger culprit simply because so many snacks, sweets and favorite foods are high in them. Every gram of carbohydrate contains 4 calories. It doesn't sound like a lot unless you stop to consider the number of carbs in some products. For example, 1 12-ounce can of sweetened cola has 37 grams of added sugar and 155 total calories, of which 148 come from added sugar. A slice of plain pound cake has 16 grams of sugar and 173 total calories. These are just two examples of carbs that contribute enough calories to ruin your daily calorie goal. They also have extra weight-gain potential because they spike blood sugar. Weight gain from consuming more calories than your body burns for energy doesn't happen overnight. As you consistently eat too much, you'll gradually reach the point where you've consumed 3,500 calories more than you burned. At that point, you'll gain 1 pound of weight. You may not notice it until, over time, it turns into 3 to 5 pounds or more. You can't stop your body from storing glycogen, so remember that weight associated with glycogen is healthy. You need glycogen for optimal performance and energy, especially if you're involved in sports or endurance activities or lead an active lifestyle. If you consume carbs on a regular basis, glycogen stores stay full and become a normal part of your total body weight. You can avoid the fat-storage effect of insulin by choosing complex carbs or starches. These carbs are made from large molecules of sugar that take longer to digest and enter the bloodstream at a slow pace. They also contain fiber, which prevents spikes in blood sugar and supports weight loss by making you feel full. 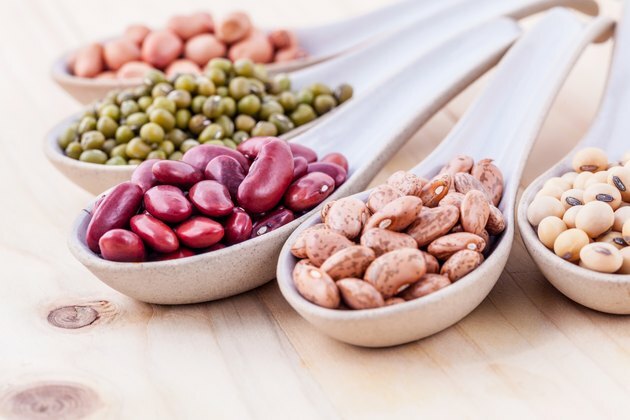 Complex carbs such as oatmeal, brown rice, whole wheat, beans, peas, quinoa and potatoes have the added advantage of providing vitamins, minerals and antioxidants. Most importantly, make sure that all the carbs you eat fit within your daily calorie goals. Forty-five to 65 percent of your total calories should come from carbs, recommends the Institute of Medicine. When it comes to fiber, women need 25 grams daily, while men should get 38 grams daily. American Council on Exercise: Why Do I Seem to Gain Weight When I Start to Train for an Endurance Race Like a Half Marathon? Can a High-Carb Diet Cause You to Retain Water? If You Eat Carbs for Dinner, Does Your Body Turn Them Into Fat? Will Not Eating Carbohydrates After 6 p.m. Help With Weight Loss?